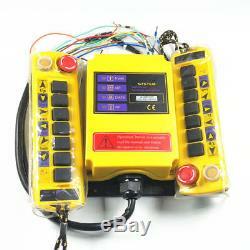 (1) 2 Speed 2 transmitter Control Hoist Crane Radio Remote Controller 1 receiver. 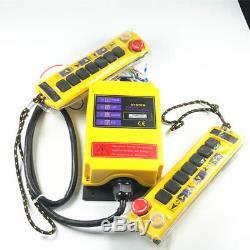 (means each button has two action). 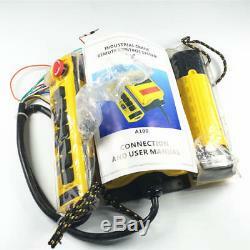 Brand new in box TYQ series rain&dust proof radio remote control. An english manual inside the package. Operation distance:100M Operation Temparature:0°C-75°C. Frequency:FM 433-868MHZ Antenna:internal type. Output power:10mW Weight(include transmitter and receiver):1.5KG. Advance program design, quick&good performance on movements. 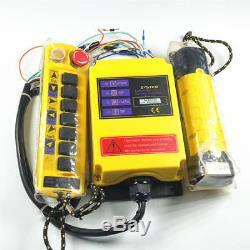 Single-raw button transmiter, compact and lighter desing, ensure safe&convenient operation. Random security code up to billions sets, each transmitter has own unique ID code. Receiver with 4-LED, quick, simple judgement for operation status&after serices. We provide you brand new and guaranteed quality. You should receive item within 2 weeks. However, we will try our best to minimize it. Wholesale and retail accessiories also we provide complete solutions for diffcult problems in these business range. 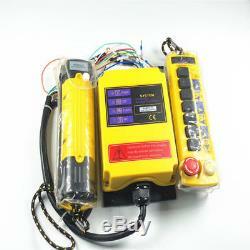 The item "(1) 2 Speed 2 transmitter Control Hoist Crane Radio Remote Controller 1 receiver" is in sale since Monday, February 24, 2014. This item is in the category "Business & Industrial\Material Handling\Hoists, Winches & Rigging\Lifting Machine Parts, Rigging\Lifting Machine Remotes". The seller is "miracle_summer" and is located in Yueqing,Zhejiang. This item can be shipped worldwide.